This review has been removed. The representative of the PR firm pushing the publicity campaign for its publication has a different view of the meaning of “Fair Use” which, if followed, would have made this review incoherent. I am not willing to do that. Sorry about the shouty headline: the UVic Press Release uses all caps and my WP editor lacks a ‘change case’ key. This actually came to me from a tweet. You do follow me on twitter don’t you? There’s now a handy widget over there on the top right if you need it. Some of the tweets do get repeated by facebook, but not many of the retweets. And quite a lot of stuff that I see does not get blogged these days, especially since Twitter changed the way retweets are done that now can include commentary. Today, for the first time, I was able to retweet something with the terse comment “Horseshit!” – something, I now realize, I have wanted to do for a long time. Climate research – and the long list of projects – is all very worthy, but I am afraid I am very much unimpressed. And I am also a bit inspired by a post in the Tyee which sets out the progressive manifesto 0f what needs to be done once we have got rid of Stephen Harper. So while the Pacific Institute for Climate Solutions (PICS) is doing its five year research project here are some things that we need to be doing right away. That is because action on climate change is now urgent. Like The Man said “We don’t have time for a meeting with the Flat Earth Society“. We do actually know what needs to be done and, sadly, these things seem to have slipped through the PICS net. First note that they are hung up on gee whiz technology. We don’t actually need any of that. There’s a whole bunch of stuff that we know about, familiar technologies and techniques that are held back simply by a combination of out of date policies and inertia. BC Transit was forced to waste money on hydrogen buses (whatever happened to them? I asked BCT but they have yet to reply) when we knew plenty about trolleybuses and extended range hybrid dual powered buses too. Nothing was learned from that five year demonstration project other than it is possible to truck hydrogen across the continent and convince yourself that you are helping the environment. Transportation and the Built Environment are treated in the research list as two separate programmes. I wonder if the researchers will talk to each other over lunch sometimes? Because we all know that land use and transportation are two sides of the same coin. The best transportation plan is a good land use plan. The best way to save energy from transportation is to cut the need to make motorised trips. Community Energy Planning should have become mandatory fifteen years ago, but Glen Clark shut down the Energy Efficiency Branch of MEMPR – and forgot all about the BC Greenhouse Gas Reduction Program. Most of the advances that we are going to see in the field of transportation will come from a combination of information technology and deregulation. (See Bridj below) There’s a great deal we can do to make better use of what we have but the rules and regs get in the way. Like bike helmets, for instance. By the way did you know that the researchers who did the study that supports BC’s current helmet law have themselves repudiated that study? Protected bike lanes work better to both save lives and encourage bike use – and they are amazingly simple to introduce. As The Lady said, if you want to see change, do it quickly. The Burrard Bridge case is as convincing as any that chaos will not ensue. Most of the change we need will start happening once we stop subsidizing fossil fuels. Indeed it is quite remarkable how much change is already under way, despite billions of dollars propping up what will soon be a dying industry. The tar sands are already uneconomic, and unnecessary, just as LNG export is a really stupid proposition in the present market. So stop throwing money at oil and gas, and you not only free up some fiscal headroom for sensible policies, but you also give the market the sort of signals it would have got if you had stuck to your guns over carbon tax. Ditch revenue neutral as a policy objective there, keep jacking up the carbon price and spend the proceeds on public transportation – local transit and high speed electric trains for longer distances. Electrify the main corridors straight away (Toronto – Ottawa – Montreal, Edmonton – Calgary) and then start building new high speed railways as cancelling freeway expansions permit. Maybe by then the Americans will have started to catch up with the rest of the world, and we can talk about Vancouver – Seattle – Portland. What I do see as problematic is that we will probably be better at civilizing the suburbs than getting real change in urban areas, where many more people live in multifamily buildings. It’s pretty easy to put up your own solar panel, and put both a Tesla car and a home battery in your own garage. If you can afford it. It is going to be much harder to get equivalent changes in condos, though co-ops seem to be doing better with things like bike storage. Public housing, of course, has to go back on the agenda. It is not enough to make the existing housing stock more efficient when so much of it is out of range of the middle class, let alone the people who struggle on unlivable wages and such welfare assistance as survives. I do not see any work being done by PICS on environmental justice. But make no mistake, we do have to tackle the issue of the lack of jobs in range of affordable housing in transit deprived areas. We do need to think about how our energy policies can be used to create better employment prospects for our own population rather than simply looking to exploit export markets for barely transformed raw materials. “Researchers will also identify opportunities to substitute timber products for carbon-intensive steel, concrete or plastics used in many sectors, including the building industry.” Start first by banning the export of raw logs to ensure that there will be some local industry to produce these wonderful things. I am really against spending so much on building technologies – where the potential savings in fossil fuels in BC are limited – when you have no plan to tackle the major user of liquid fuels – personal transportation. Again, we know that old fashioned ideas like trolleybuses, trams and interurbans – even diesel buses, for goodness sake – produce far less ghg per passenger kilometre than single occupant internal combustion engine cars and trucks. So we really do not need any more research on “the distribution potential of alternative fuels including compressed (CNG), liquefied (LNG) and renewable (RNG) natural gas.” Even if every car could be electric, zero emission at a wave of a magic wand we would still have all the present problems of traffic, road deaths and urban sprawl. There is even less saving in ghg in having a carbon zero or even positive reduction in CO2 building if it is stuck out in the middle of nowhere – and everybody is driving to and from it! On the other hand, increasing bus service frequency and reliability – mostly by paint on the streets – is a well established technique for increasing transit use – and it doesn’t all come from cannibalising walking and cycling. Much of it comes from unpaid chauffeuring. The article on Bridj really got me thinking. First note that this service is actually delivering something slower in downtown DC than can be achieved on a bike. But then this guy is also wasting time “20 minutes to shower and change” after his ride. Imagine someone from Copenhagen or Amsterdam writing that. Bridj could be a serious challenge to transit – much more than Uber and Lyft which are aimed at the taxi market. Or it could be a very useful supplement, and work much better than Community Shuttle service does in the suburbs. Indeed, when you look at how it works, isn’t that a good description of what HandyDART was supposed to do? And how about we simply abandon (once again) the old “separate but equal” philosophy, and instead of having a segregated service for people with disabilities – which actually does not work very well at all – but have a service which anyone can use. But is cheaper to deliver because you separate out the paying for it from using it. $5 for a ride on a profit making service? If the math is right, that is cheaper than most Community Shuttles, and much less than HandyDART. The driver, of course, would continue to help those who need assistance for door to door movement. As I have always said, in the low density areas (which includes most of Vancouver south of 12th Avenue) we need something better than a bus but cheaper than a taxi. Bridj isn’t going to attract people who can use really good transit. But then we don’t actually have that in much of the region, and it is not at all clear that we will turn out to be ready to pay for more of that yet. Oh, and before I forget, we would also need to sort out a much more equitable transit tariff, based on ability to pay, but that is a subject for another day. Now, we don’t have much ethanol around here, and the electricity we use is mostly from existing hydro. So some of these results from the US don’t exactly translate here. 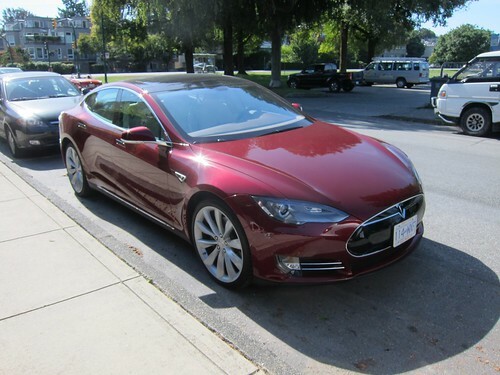 So if you can afford a Tesla, go right ahead and don’t worry about those “electric cars are not so green” articles. The only time we use dirty, coal fired electricity is when our generating capacity is stretched at peak periods. 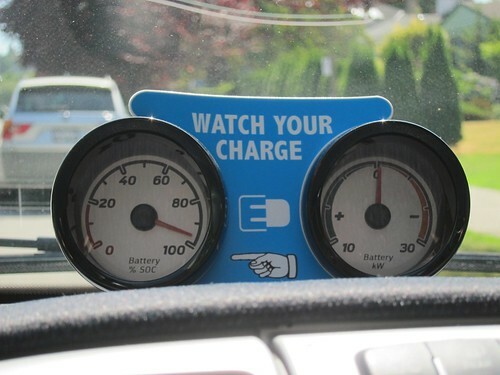 Charge up your car overnight with a clear conscience. The ethanol they refer to is E85 (85% of the fuel is ethanol): the most we use is 5 to 10%. At one time this was only true of so called premium fuels. Now it is not unusual to see ethanol in regular fuel and you may have to buy premium to avoid it. Most cars, of course, do not need premium fuel. While hybrid cars do cut fuel consumption, this gets negated pretty quickly if you drive with a lead foot, or use a vehicle much bigger than you need. 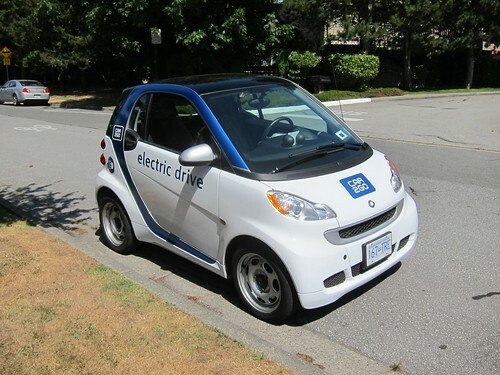 A smart car is going to use less gas than a giant SUV or truck, even if they are hybrids. And simple precautions like checking your tire pressures and not hauling a load of junk in your trunk will also cut your fuel consumption. Walking, cycling and transit (even if it is a diesel bus) are all better for the environment – and your own health. Published in the Proceedings of the National Academy of Sciences of the U.S.A. There is a lively debate going on first as a result of some research at North Carolina State and then some rebuttals at web sites like Slate. I was going to join in there but there are already 197 comments there – and anyway I am going to drag this off. It is not about the emissions – or lack of them. As I have said here before, the problem is that they are still cars. Cars are the problem. 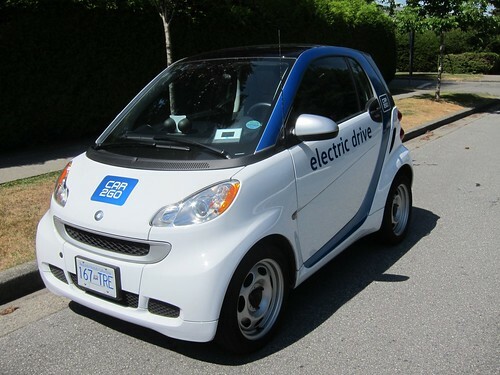 An electric car is a little bit better than an internal combustion engine car – but then a Smart car is better than an SUV or a Car2Go smart car is better than either. And in actual experience the emissions performance is better than expected. But cars are still a leading cause of death and ill health. 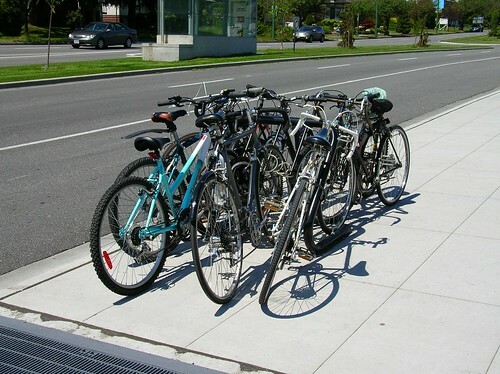 They take up far too much space in cities – moving and parked. We can easily accommodate the next million people who are coming to this region, but not if they insist on driving everywhere. Even the President of the Ford Motor Co recognizes that. It is bad enough what cars do to us – as the result of collisions and the inevitable congestion – but even worse is what it does to the places we live in. The interconnectedness of society is irreparably damaged by infrastructure designed simply to get cars through urban areas as quickly as possible. We can easily electrify our transportation systems using existing technologies. We could build streetcar systems within towns and interurbans between them – and still live like they did in the 1920s. We could add electric high speed trains to cover longer distances, and reduce not just car travel but jet aircraft too – and that really does make a significant difference to emissions. But the greatest benefit would be the ability to live without owning a car and getting everything we need within walking distance. We would abandon the ideas that have been so bad for us – like separating out land uses, and building single family home subdivisions which waste so much valuable farm land (which we do not value properly). We could protect much more of the wilderness and watersheds as a result. The reduced need for fossil fuels may be what drives this progress but the benefits in terms of health and quality of life are going to be the unique selling proposition that gets people on board. The sort of places which keep cars under control and make them largely unnecessary are going to be the ones that are most successful. While we now think that being “Green” is good, I think that “livable” may have been a more accurate term for what we want from urban regions. But as long as there are lots of “thought leaders” being seen in their Leafs or Teslas, we will continue to think that we can continue to live as though it was still the 1960s. The vehicle looks much like any other car2go. 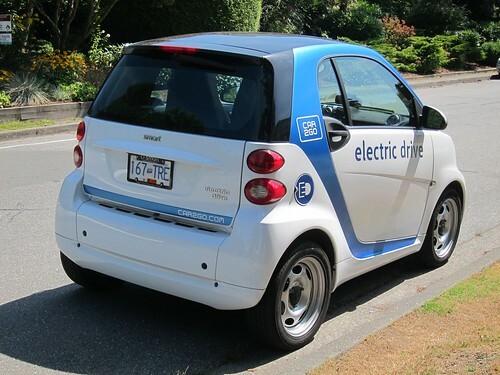 I think the term “electric drive” could easily be confused with a hybrid, which while it has an internal combustion (IC) engine does indeed have a final electric drive. But this is a real EV – a battery only electric vehicle. Actually this is one of the nicer variants of the Smart car that has a glass roof and electric motors to control the door mirrors. And, as seems to be common practice, the roller blind across the ceiling had been left open, and the car parked in full sun. So it was a nice little oven to get into – with extra frying on the seat and seat back. Cloth upholstery would be so much nicer. Everything about the car is as similar as possible to the IC car. It has an “ignition” key – just nothing much seems to happen when you turn it except the radio comes on and you can open the windows and turn on the fan. It also has air conditioning. I turned that off as soon as it was comfortable enough, and drove with the windows down. 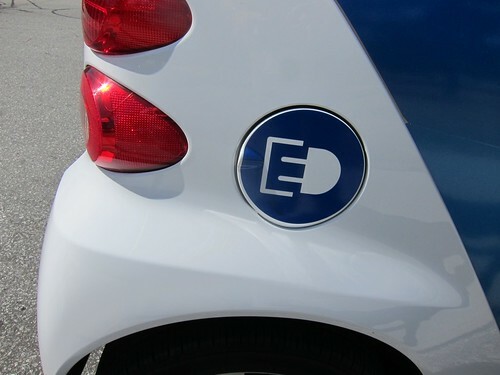 At city speeds, that is more energy efficient. Using a/c and keeping the windows closed works better at highway speed. The pick up on any electric vehicle is always better than any IC since the torque characteristics are quite different. You can easily leave everyone else standing at the lights if you want to. 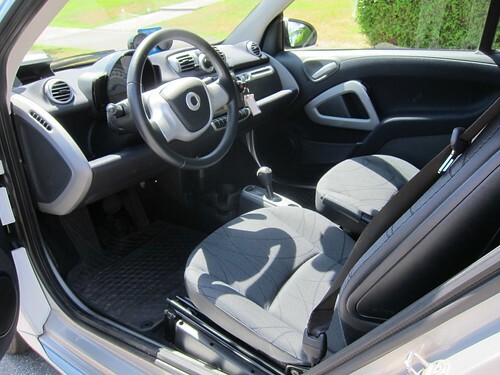 Some of the older IC Smart cars are quite sluggish, especially from a standing start, and with a distinct lag after each gear shift. Although I did take it around the houses so I could try it on the hills of Kerrisdale (nothing to report there) and traffic was light, the whole journey was easy and used hardly any juice. I think the needle must have gone down a bit but for most around town use I should not think that range is going to be an issue. I know you get can a charge at City Hall. Maybe there’s something on the in car navigation system about charging stations – I forgot to check. There is a key fob for charging. I didn’t notice if there was a credit card. I found the hype of Elon Musk’s “HyperLoop” easy to resist. On twitter, Jarret Walker seemed to hit the right note of skepticism, as you would expect. The problems of human transportation being mostly about the basic physics and geometry issues. The greatest weakness of the analysis is not so much Musk’s assessment of potential number of trips but a lack of appreciation about how much network connectivity is going to matter to make the low density sprawl of southern California work to feed his point to point service. Personally I would far prefer a High Speed Train, though I can easily understand the frustrations of those who feel let down by the tentative approach being taken in California. I much prefer to look out of a window (though in an HST keeping your eye on the distant horizon is important for comfort) but most of all I like to get out of my seat and walk around when under way. This is not exactly encouraged on planes or buses – but is at least feasible. I find the idea of remaining seated in a windowless vehicle claustrophobic. Even if it is only for half an hour. Thanks to Sightline again for the link to an AP article in the Seattle Times. It is a very useful, non-technical review of the lack of progress in battery technology. “It’s why electric cars aren’t clogging the roads” which is a useful bit of reality check against the optimism expressed by the report I looked at yesterday. As for the electric car industry, lithium ion batteries have proved to have two major drawbacks: They are costly, and they do not allow automobiles to go far enough between rechargings. A123, a maker of lithium ion batteries for electric cars, went bankrupt last year because of poor demand and high costs after receiving a $249 million federal grant. I know I have covered this ground before, but it is worth re-stating. What we want is the comfort and convenience of the car without its environmental impact. It is based on the mistaken idea that if we could get rid of the internal combustion engine – or the fossil fuel it now runs on – all would be well. And that is not true. The problems we have due to cars include urban sprawl, health impacts from that as well as the direct impacts of vehicle collisions (even if we can bring ourselves to trust computers to drive the cars for us), huge economic dependency of both societies and individuals from over-investment in a movement device that spends nearly all of its time stationary, congestion and delay. If every car was suddenly to become zero emission tomorrow, nearly all of the problems of motordom would remain to be solved. it has conflicting functions. Its primary job is to store energy. But it’s also supposed to discharge power, lots of it, quickly. Those two jobs are at odds with each other. At this point I expected a diversion to fuel cells: mercifully that isn’t there – but again yesterday’s report was full of optimism about hydrogen. Which is not a fuel at all but simply a way of storing and transmitting electricity – and not a very good one at that. It is horrendously expensive and very inefficient – simply because hydrogen is the smallest molecule and thus extraordinarily hard to store. That does not mean we cannot expand the use of electricity in transport – just that we will have to concentrate on technologies that we know work, even if they are not quite a perfect replacement for the convenience and mobility of the private car. What we need to convince ourselves about is that neither of those things is a project killer. We don’t actually need so much mobility if we only could redesign and retrofit our cities to be more accessible. If what we want was in easy reach by walking – or cycling – and both modes were safe and attractive – we will do a lot more of both, reducing both our carbon impacts and the size of our waistlines. For longer journeys, fixed route public transportation that is unhampered by single occupant vehicles can be readily powered by very long extension cords – trolleybuses, streetcars and trains. As long as these have adequate priority the expense of grade separation can be avoided. Yes, private cars will be delayed. Good. That improves the case for modal shift and saves lives. I also think that by now somebody ought to have taken the step of putting a set of lightweight trolleypoles on the roof of a hybrid bus – or shoving a hybrid power plant into a trolleybus. 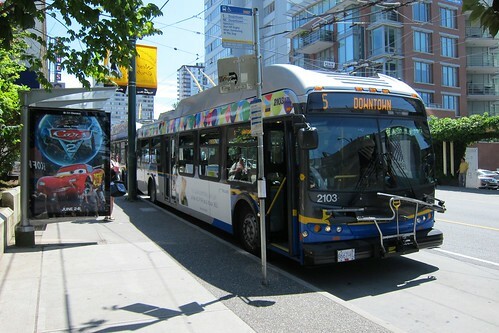 Then we in Vancouver could see extensions of trolleybus routes to useful destinations – and redeployment of diesel buses to the suburbs. 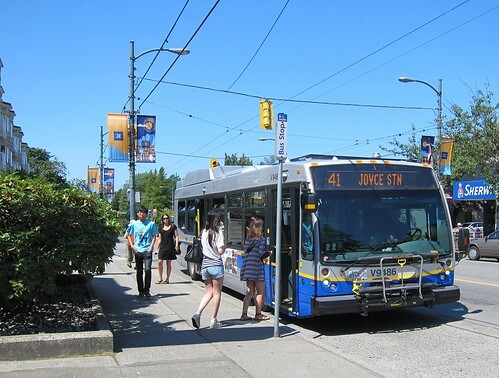 So the #41 to UBC gets converted, the #9 extended to Brentwood – and the inner set of “express bus” wires along Hastings get used for SFU services instead of being an historical anomaly of earlier faster trolley bus service to the PNE. For one group, the use of lightweight cheaper batteries is already paying off handsomely. In general I do not think that electric bikes are such a great idea. For better health outcomes alone, I favour human power as much as possible. But we have an aging population. When you are young, you have time but no money. In middle age you have money but no time. Then, just when you have money and time, your knees give out. That is when a power assisted pushbike makes all kinds of sense. So we can indeed reduce the use of oil (and other fossil fuels) in transportation – and it doesn’t require any kind of technological advances. We already have “good enough” technologies which are getting better. Information technology has done a great deal to reduce much of the frustrations inherent in using transit, and for facilitating things like bike shares and car shares which could be so effective in increasing its range and effectiveness if only they were integrated properly. What is missing is not some whizzo battery – or personal rapid transit or a cheap fuel cell. It is political will and resources. And that has been the case for nearly all of the time I have been conscious of the issues – over fifty years! Conservatism – the power of the special interest group we refer to as “the elite” – the 1%. That is the root cause of the problem – however you decide to define the problem. Unaffordability of housing, traffic congestion, bad air quality, environmental impact, global warming. All of these issues are based on the incredible selfishness of a very small group of people. Many of who spend a great deal of time and money telling us how much they care about these issues but none of which ever seem to get solved. Even though the solutions have been staring us in the face all that time.